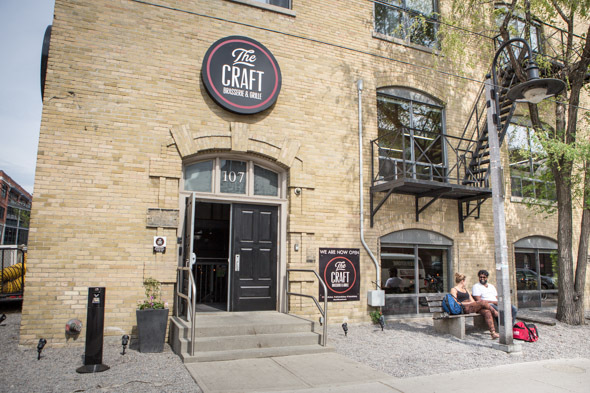 The Craft Brasserie & Grille occupies the sunken corner lot at Atlantic and Snooker in Liberty Village. 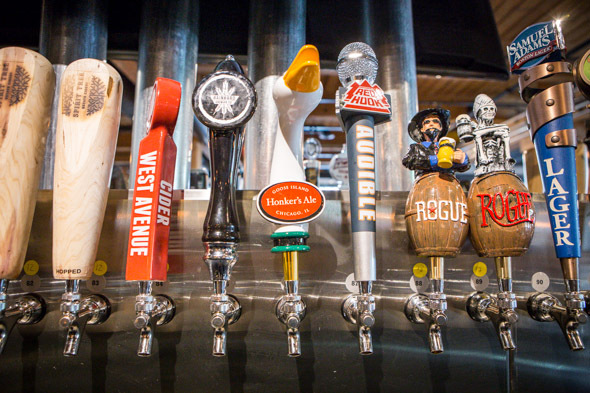 It joins a pocket of pubs and beer halls in the neighbourhood including William's Landing and Local Public Eatery , but aspires to distinguish itself from the pack, by offering the largest selection of draught beers in the city. 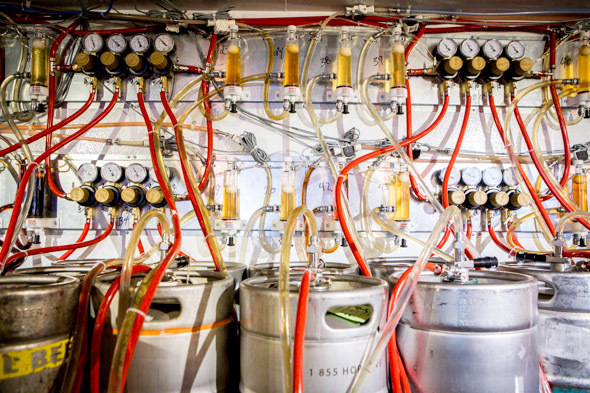 On tap you'll find 120 brews, outnumbering even Real Sports and its impressive 114 taps . The choice is overwhelming and the beer menu in chart format, set in a tiny font, is about as exciting to read as a phone book. 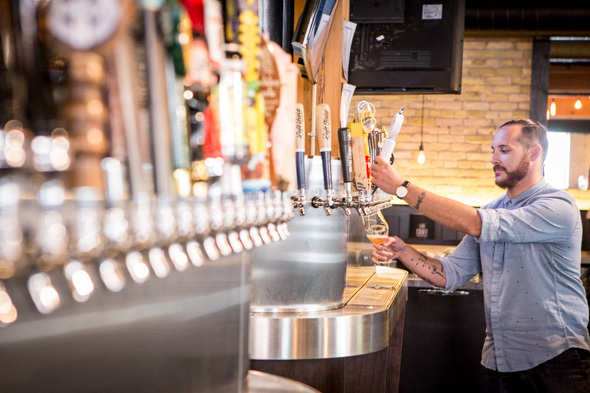 Snag a seat at the bar if you can to chat up Bar Manager and Prud'homme Beer Sommelier, Matt Sieradzki. He can certainly point you towards the treasures and make tailored suggestions. Or you can try a flight of beers ($10.50) featuring four 5oz pours as some educational drinking. 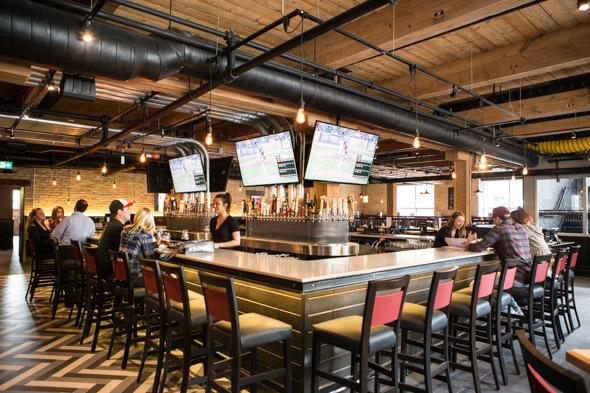 The massive 300-seat basement beer hall is sparsely adorned, but typical of the neighbourhood, the brick and beam space is naturally good looking. Windows to the keg fridge and open kitchen might count as the only points of interest, but on a positive note, there's an ample supply of cozy booth seating. The menu is mostly what you'd expect; beer-friendly snack foods, shareable finger foods, sliders, flatbreads, burgers, and an eclectic list of entrees. 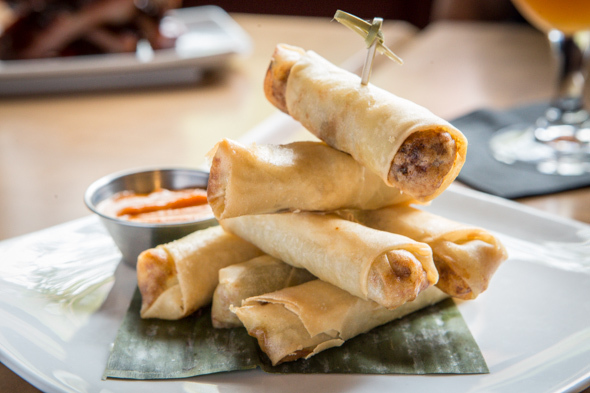 What piques my interest most is that interspersed with American standards are a handful of Filipino favourites like chicharron ($5), golden plantain chips ($4), and lumpia ($9), crispy pork-filled spring rolls with a side of house-made banana ketchup for dipping. 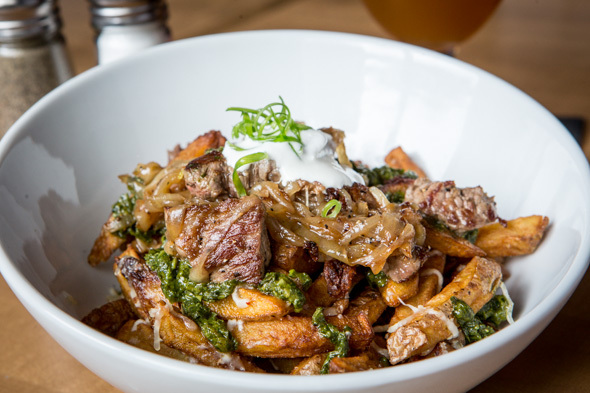 Billed for sharing, there are Asada Fries ($13), akin to poutine but with a Southwestern twist. This dish starts with a base of hand-cut, twice-fried frites loaded with jalape単o cheese, sliced strip steak, caramelized onions, and creme fraiche. 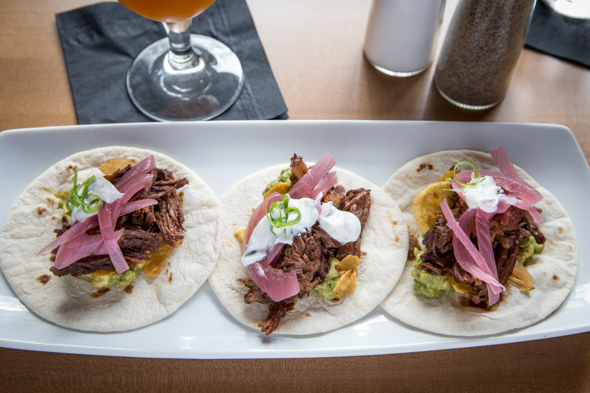 I'm not such a fan of the short rib tacos ($13). They're dressed with creamy guacamole, garlic mint yogurt, tangy pickled onions and crunchy plantain chips. While they sound good on paper, the creamy components overpower the whole dish and there isn't enough seasoning or spice to balance it out. Beer glazed ribs ($15) with a jicama slaw are more up my alley. 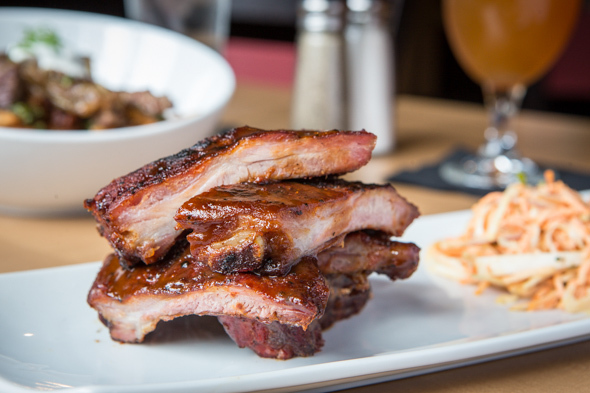 They're slow smoked and then glazed in a Red Razor IPA which results in toothsome, peel-off-the-bone ribs with a flavourful candy coating. Not only does The Craft pour beers until 2am, but the kitchen is open until last call as well. Brunch is set to launch sometime this summer, while a patio is in the planning stages.